At a glance, motorized blinds might just look like a more convenient version of regular window treatments, but they have a surprising amount of uses. Aside from their obvious function of controlling how light enters the home, they can be used to improve different areas of your home, and your quality of life. You might be wondering how something like electric blinds could possibly be used as part of your home security system, but it’s all part of creating an illusion. The illusion we’re talking about is the illusion of an occupied home. Rarely are burglaries ever random. Thieves scope out neighborhoods and houses to see which ones look unoccupied, or they check for the times of day when no one is home. By setting your window treatments on a schedule, you can make your home appear habited even while you’re away from home – on a trip or even at work. Better home security has been one of the big attractions of home automation. Electric window treatments that can be used with a phone app are just another part of home security and automation. There are a couple different ways that motorized screens can be used to create a more impressive home theater. If you like viewing movies using a projector, a retractable white screen provides the perfect surface for viewing movies, and it looks a lot more pro than hanging up a sheet or using a blank wall. Another way is by installing a motorized screen to cover your wall-mounted TV screen when not in use, and retracting to reveal your TV screen just prior to movie viewing. It’s just like pulling back a curtain at a theatre, except with a push of a button. Whether you’re looking for a projector or something to protect and cover your TV screen, our motorized screens can be installed vertically or horizontally, depending on your preference. Once you become accustomed to sleeping in a completely dark room, it can be difficult going back. Napping babies and children, or those who work odd hours or are sensitive to light at night will be able to sleep no matter what time of day. Motorized window treatments provide the total coverage needed to completely black out a room, without the hassle of fussing with drapes trying to cover every opening. The reason motorized blackout curtains are ideal, is due to their ability to be set on a timer. Blackout curtains can easily cause someone to oversleep, as exposure to gradually increasing sunlight is part of the body’s waking process. By setting your window treatments on a timer, you can ditch the alarm and wake up to the light of the sun. It’ll also keep you from oversleeping! Because our coverings are 100% custom made, they can installed to fit your garage door openings. If you use your garage as a workshop, or find that you spend a lot of time going in and out of it, an automatic opening or screen can be the solution you need to make your garage more accessible. Instead of having a permanent structure built to surround your deck or patio, you can use retractable screens for large openings. Have a barrier when you need it, but hides away when you don’t gives you more flexibility in how you use your outdoor space. How you want to use screens outside can change based on the season, occasion, or daily weather fluctuations. 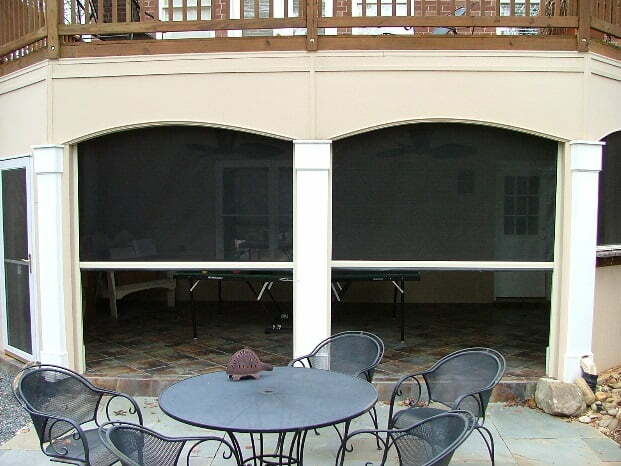 Retractable screens come in many different materials, capable of keeping out the smallest insects, blocking UV rays, and withstanding strong gusts. When you want to create a cozy enclosed space for super comfortable outdoor lounging, or an open space for outdoor parties, you’ll love having the best of both when you need it. We hope this article gives you some inspiration for different ways you can use motorized blinds in your home. If you’re looking for electric blinds in Toronto, we can customize indoor window treatments and outdoor screens to accommodate your specific needs. Contact us to explore your options!